While dobsonfly is the commonest name applied to these insects, I much prefer “go-devil” (not sure of the origin) and “grampus” (from “Krampus”—a mythical horned, creature in Alpine countries). The latter name in particular pays more appropriate homage to the monstrous appearance of these insects. Photographed July 2011 at a blacklight sheet in Sam A. Baker State Park, Wayne Co., Missouri. This entry was posted in Corydalidae, Neuroptera and tagged entomology, insects, Missouri, nature, science. Bookmark the permalink. The floral pattern on the neck remind me of a Tiffany lamp. Lovely shot. Thanks. I do see the resemblance now that you mention it. Any idea of the origin of the names “Dobsonfly” (adult) and hellgramite (larva) for these things? I have done some searching and found nothing, other than that both names go back a while. I would speculate that “dobson” might be a Native American name (transcribed to English), but that is just because it does not appear related to any English meaning, or anyone named Dobson. Your thoughts at BugGuide on the origin of these names are the most thorough that I’ve seen. Most other sources say “Etymology obscure” (if they say anything at all). Too bad we don’t know for sure, because they are interesting names. There is primary literature on folk names for critters in North America–a search through some relevant sources might turn up something, but would take some time. 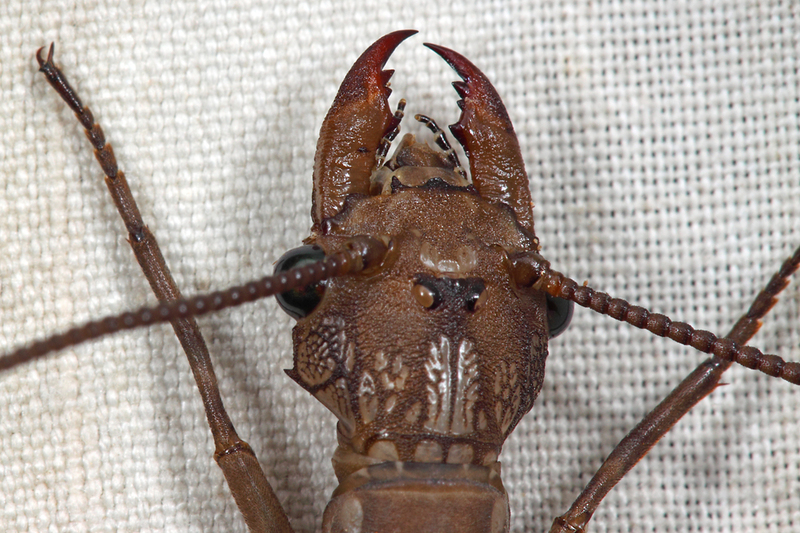 Your opening question, “Ever taken a close look at a female dobsonfly’s head?” is pretty funny. Well, er, um, no not really. But thanks to you, I now know it’s complex and beautiful. http://bugguide.net/node/view/4873 says the naming is related to the surname Dobson but they aren’t sure of who that is. Hi Martha – my reaction after seeing the photo on the computer screen was the same. I had no idea the sculpturing was as complex as can be seen in the photo. Patrick (previous comment) is the author of the BugGuide page. A more thorough etymological discussion of the names does not exist to my knowledge. For some reason, I’ve always found insect heads to be interesting, and often entertaining. While I’ve seen far more ant heads than beetle heads, this one is quite nice! It’s no secret that I’m a head-man! I love the detail markings on the head nearest the thorax. I would have not guessed this photo was taken at night……sweeeeett!! Hi Roxane. Hope things are going well down in Cape. I’ve seen dozens of dobsonflies over the years and never suspected they had such interesting sculpturing of the head. I was really just messing around taking close up photos of different insects that came to the sheet – this one really surprised me when I saw it up close. I’ve wondered this sort of thing before, but what could be the adaptive benefit of such sculpturing? Recognition? The degree to which sculpturing can vary among congenera of insects is rather interesting. That’s a good question. Besides recognition, other possible functions might include diffusion of light to aid in crypsis or enhance mimicry, structural support for underlying muscles, and distribution of sensory structures—perhaps even a combination of multiple functions. Regardless, I find the patterns and variety endlessly fascinating. Man, corydalids are cool! I just love them. Lovely shot Ted! Probably attracted to the lights in the house. No, they are not poisonous and are completely harmless. I hope let it go. I have a bug in my bedroom and it comes out at night and flies into my small fan and plays(?) in the running fan. Disappears very quickly and therefore can never catch it. It was on my bed (with me in it) last early morning, not too much light! How do I get rid of it? Hate to kill it but I am thinking of fogging that room. Please help if you know of anything else I can do. Thank you! If the insect in your room is a dobsonfly, it should be harmless, as Ted has stated above.